November 1 is celebrated throughout the Catholic world as Día de Los Santos, or All Saints Day, to honor all the saints, known and unknown, of the Catholic faithful. While it may seem like it would be a sad affair, in many parts of South America it's a reason to celebrate. Every day of the year has its own saint or saints, but there are more saints than calendar days, and this one major holy day honors them all, including those who had died in a state of grace but had not been canonized. And, to keep things fair, November 2 is celebrated as the Day of All Souls. Día de Los Santos is also known as Día de los Muertos, or Day of the Dead. Like many other Catholic celebrations, in the New World it was grafted onto existing indigenous festivities to meld the "new" Catholicism with the "old" pagan beliefs. In countries where the Europeans eventually reduced the indigenous populations, by one means or another, the celebrations gradually lost their native meaning and became more of a traditional Catholic event. This is why the day is known under many different names and also why it is celebrated differently from town to town and country to country. In Latin American countries where the indigenous culture is still strong, such as in Guatemala and Mexico in Central America, and in Bolivia in South America, Día de Los Santos is an important meld of many influences. It's possible to see older indigenous customs and traditions blending with newer Catholic traditions. In Central America, the dead are honored by visits to the their gravesites, often with food, flowers and all family members. In Bolivia, the dead are expected to return to their homes and villages. The Andean emphasis is agricultural, since November 1 is in spring south of the Equator. It is the time of returning rains and the reflowering of the earth. The souls of the dead also return to reaffirm life. During this time, the doors are opened to guests, who enter with clean hands and share in the traditional dishes, particularly the favorites of the deceased. Tables are bedecked with bread figurines called t’antawawas, sugarcane, chicha, candies and decorated pastries. At the cemeteries, the souls are greeted with more food, music, and prayers. Rather than a sad occasion, the Día de Los Santos is a joyous event. 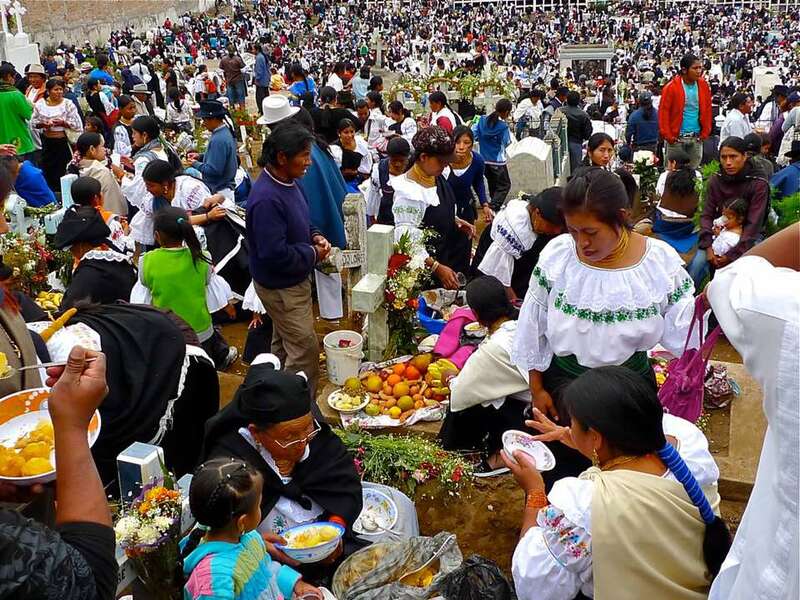 In Ecuador families flock to cemeteries to celebrate, it's a party with food, alcohol and dancing to remember loved ones. In Peru, November 1 is celebrated nationally, but in Cusco its known as Día de todos los Santos Vivos, or Day of the Living Saints and celebrated with food, particularly the famed suckling pig and tamales. November 2 is considered the Día de los Santos Difuntosor Day of the Deceased Saints and is honored with visits to cemeteries. Wherever you are in Latin America on the first and second of November, enjoy the local holidays. You'll notice the streets becoming colourful and if you play your cards right you may be invited to join.